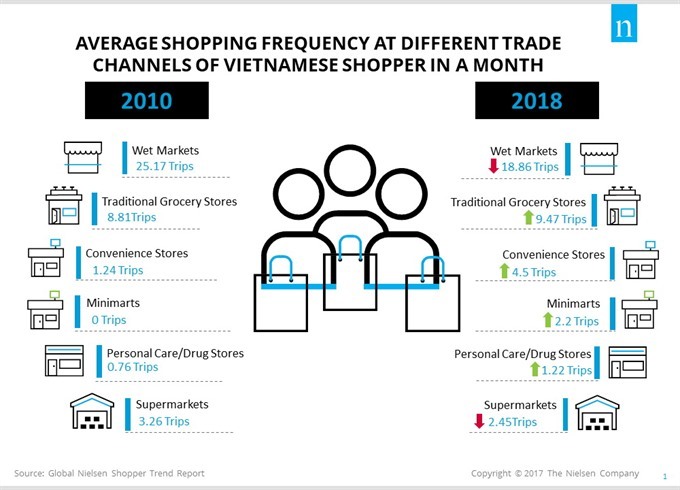 Vietnamese shoppers have reduced their visits to wet markets and go to convenience stores, minimarts, personal care/drug stores and traditional grocery stores more often. 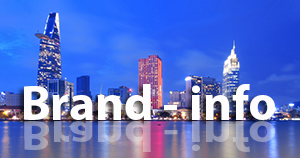 HCM CITY — Though traditional trade, including wet markets, still dominates in the country, modern channels have gained impressive momentum, according to Nielsen’s latest Shopper Trend report. Since 2012 the number of convenience stores has nearly quadrupled and minimarts comprised the most store openings in the first nine months of this year, the report said. Health/beauty and modern drug stores have also expanded quickly, doubling in the past two years. Vietnamese shoppers have reduced their visits to wet markets and go instead to convenience stores, minimarts, personal care/drug stores and traditional grocery stores more often. The number of shopping trips per month to wet markets has fallen from 25.17 in 2010 to 18.86 this year. Visits to convenience stores have increased from 1.24 to 4.5. Personal care/drug stores now have a visit rate of 1.22 compared to 0.76. Because modern retailers continue to expand and invest in improving their stores to attract more shoppers, the future outlook of this channel is set to further improve. According to Nielsen Retail Audit data, sales of fast-moving consumer goods at modern trade channels in urban areas enjoyed 11.3 per cent growth in the second quarter of this year compared to 1.6 per cent for traditional channels. 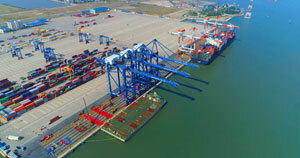 The shift in modern trade structure should bring a positive change for Vietnamese shoppers because they now have more options. First of all, when urban shoppers have less time, work in crowded cities, face traffic congestion and live further away from their workplace, they need convenient solutions and products that could help make their life easier, he said. Secondly, with a major concern about the economy and high priority for saving, consumers focus more on minimising wastage, and by buying fewer items more frequently they reduce the amount of perishables that are thrown away, he said. Besides, rather than spend cash on bulk buying, they manage their cash flow by spending smaller amounts more often, he explained. Thirdly, it comes as no surprise that health and wellness is a top-of-mind priority for consumers given that it has been mentioned as important for few years now, he said.